The New York Yankees snapped the Tampa Bay Rays five-game win streak Monday, breaking a sixth inning 1-1 tie and ultimately rolling to a 4-1 victory. New York now sits atop the AL East at 12-8, while the Rays fell to 11-9 on the season. Nathan Karns started the game and battled through 4-2/3 innings of inefficient ball. The wheels came off in the fifth when Karns loaded the bases with two outs on a pair of walks and an infield hit. Manager Kevin Cash pulled Karns in favor of RHP Brandon Gomes. Gomes walked Brett Gardner to force home the game’s first run. As Neil Solondz (Rays Radio) noted, it was the first of nine inherited runners that Gomes had allowed to score. Karns’ final line: 4.2 IP/3 H/1 ER/2 BB/5 K, throwing only six of 19 first-pitch strikes. Knotted at one, Brandon Gomes — who was pitching for the fifth time in nine days — gave up a well struck solo shot to Brian McCann to right field, before the offensively strapped Carlos Beltran followed with a double off the wall in center. Gomes struck out Chris Young before Cash called upon LHP Everett Teaford to face Stephen Drew and keep the Rays in the game. He was not successful. Teaford quickly gave up a run double to Drew, giving the Yankees an insurance run. 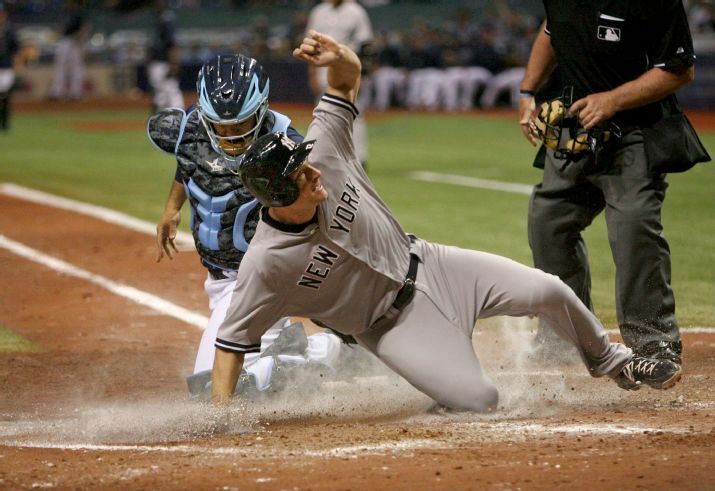 New York tacked a final run with two-outs in the eighth inning, when Jacoby Ellsbury drove in a run on a bases loaded hit by pitch. It was the first time all year, including spring training and when I was down at Triple-A, that I felt I didn’t throw the ball well. Tampa Bay tied the game in the top of the sixth against Adam Warren when David DeJesus singled to center, and advanced to second on a wild pitch. Steven Souza Jr. moved DeJesus to third on a sac-fly to center field. With the infield in, DeJesus made a great slide around McCann, scoring the tying run on Asdrubal Cabrera’s grounder to second. The Rays tallied six total hits, two by Evan Longoria who’s now 9 for-his-last 11. Jake Odorizzi will make his fifth start of the season Tuesday nigh against Chase Whitley. 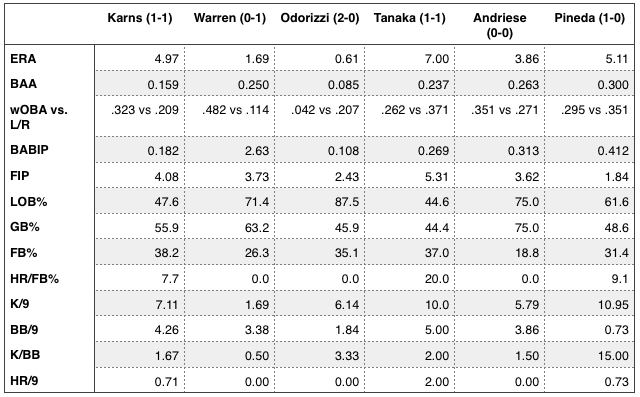 Odorizzi has pitched into the seventh inning in all four previous outings. Whitley was called up from Triple-A to make a spot start, giving Masahiro Tanaka five days of rest before his next outing Wednesday. You can read about the pitching match-up in our series preview. — Desmond Jennings is listed as day-to-day because of left knee bursitis. He said this is not an injury that would require a stint on the disabled list. It should be noted, he was dressed and ready to pinch hit Monday night. Alex Colome (pneumonia) should return this weekend. — The Rays had brief meeting to update the players on the situation in Baltimore. The team will come home this weekend to face the Orioles rather than play in Baltimore. The Orioles will be the home team at Tropicana Field, and the Rays will not shift any previously scheduled home series to Baltimore. Details on game times and ticket information is expected shortly. It’s different but it’s the right move … The circumstances call for extreme measures. The decision to play at Tropicana as opposed to in Washington or Philadelphia was a mutual one — both teams felt it was better than playing at a neutral site. The Orioles will get revenues from the games and will be responsible for any expenses, therefore they will keep 100% of the ticket revenue. Tampa Bay wIll wear gray uniforms, while the Orioles will wear white at the Trop. Other details are being worked out, but a “generic” presentation should be expected, i.e. no usual Rays promos or in game stuff. 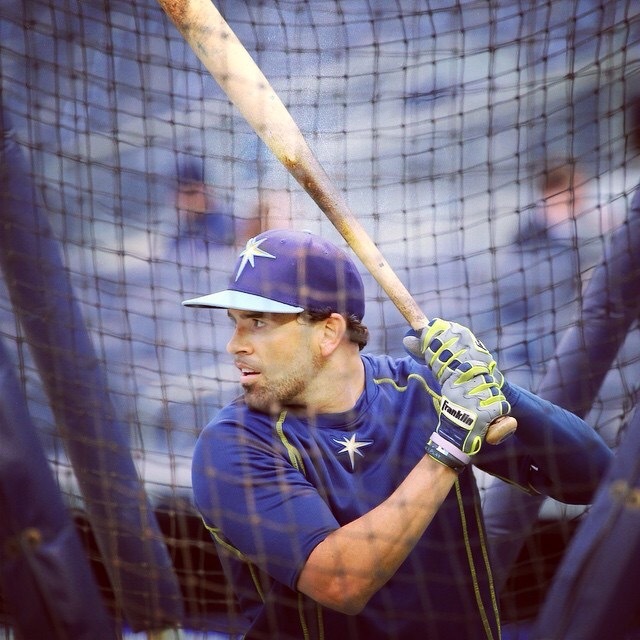 The soon to be activated Alex Colome will get the start Friday, and will be followed by Chris Archer and Nathan Karns. — The Rays have added LHP Xavier Cedeño to the active roster. LHP Everett Teaford has been designated for assignment. 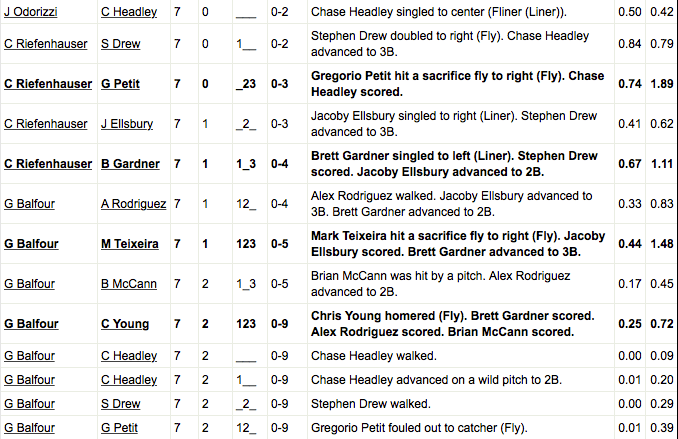 The Tampa Bay Rays borne photo box score says it all. 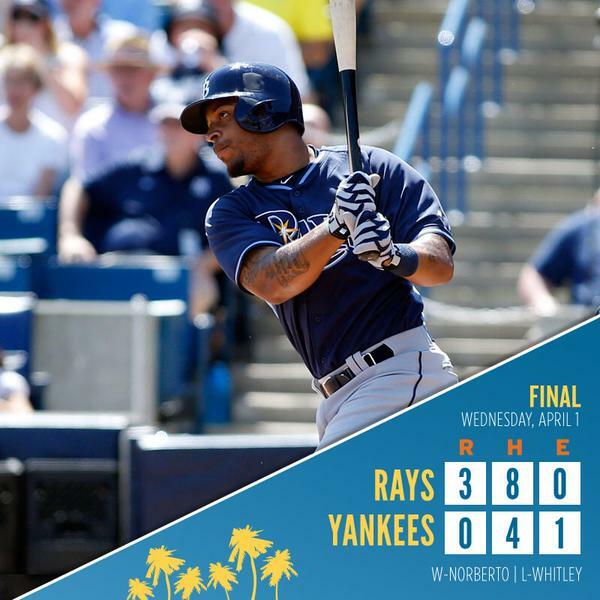 With three games left in the Grapefruit League season, the Tampa Bay Rays were able to walk away from Tampa with their 13th tally in the spring win column. The pitching staff stifled the Yankees, blanking them throughout course of the game and allowing only four hits and four walks. Meanwhile James Loney and Desmond Jennings combined to go 5-6 with three runs, an RBI, and two doubles. — Starting pitcher Jordan Norberto kicked things off strongly, quickly coaxing two poppers out of Jacoby Ellsbury and Brett Gardner — both to left field. Yet he didn’t fare well against Carlos Beltrán and Mark Texiera, relinquishing two consecutive base hits with Brian McCann stepping to into the batter’s box. McCann was able to work a full count before Norberto threw a filthy 81 mph sweeping slider on the outer portion of the plate to shut down the Yankees opening threat. The righty came back out for the second inning and allowed free passes to Chase Headly and Alex Rodriguez. After falling behind Stephen Drew, Norberto was able to force the Yankees second baseman into a 3-6-3 double play. Yet the three wasn’t over. Norberto walked another batter to put runners on the corners, however, he was able to pop Ellsbury out for the second time in as many at-bats. On the whole Norberto’s breaking pitches looked sharp, as did his fastball when he was able to locate the pitch. 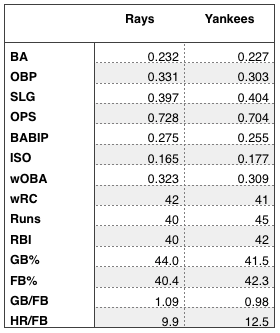 If he doesn’t crack the Opening Day roster, he could make an impact on the Rays at some point in the season, assuming he continues to progress with Triple-A Durham. My stuff’s good. I’m happy where I’m at right there. Feel good. I’m out there throwing strikes, and that’s what I want to do. I feel like I’m working a little faster and throwing strikes. And that’s a good thing. For what it’s worth, Balfour’s put away pitch this afternoon was a filthy, biting, slider to Brett Gardner. If you recall, his slider was largely ineffective last season, because he was unable to set it up properly since he lacked fastball command. If he can regain that command with fidelity, Balfour could be effective once more. For a limited spring, he has looked very sharp, and he keeps getting better. — Kirby Yates was next in the parade of pitchers, and though he posted two innings of no hit ball, he wasn’t as effective as his line suggests — at least in his first inning of work. Yates fell behind the first two batters he faced (3-0 and 3-2) before inducing a fly-ball to right and a grounder to short. He was able to fan Alex Rodriguez on four pitches, however, of the 12 total pitches Yates threw in the inning, only five were strikes. Yates was markedly better in the following frame, using just 11 pitches (eight strikes) to coax two grounders — both to Asdrubal Cabrera — and a strikeout (looking) of Ellsbury. — Jhan Marinez then threw three, one-hit innings on 40 pitches (26 strikes), fanning four along the way. If the seeing eye test is worth anything, this was easily Marinez’s best outing of the spring. — James Loney (3-3) doubled as part of a three-hit performance Tuesday afternoon. Desmond Jennings (2-3) doubled and scored on Loney’s second-inning single, giving the Rays all the runs they would need in the contest. Jennings scored twice and raised his batting average to .463 for the spring. I feel pretty good, Jennings told Bill Chastain (MLB.com). Feel like I’ve prepared myself for [the season]. Chris Archer will start for Tampa Bay Thursday afternoon when the Rays travel to Clearwater to face the Phillies. Also slated to action are Nathan Karns, C.J. Riefenhauser and Steve Geltz. This will be the final tuneup for Archer and Karns, who are expected to start during the first series. 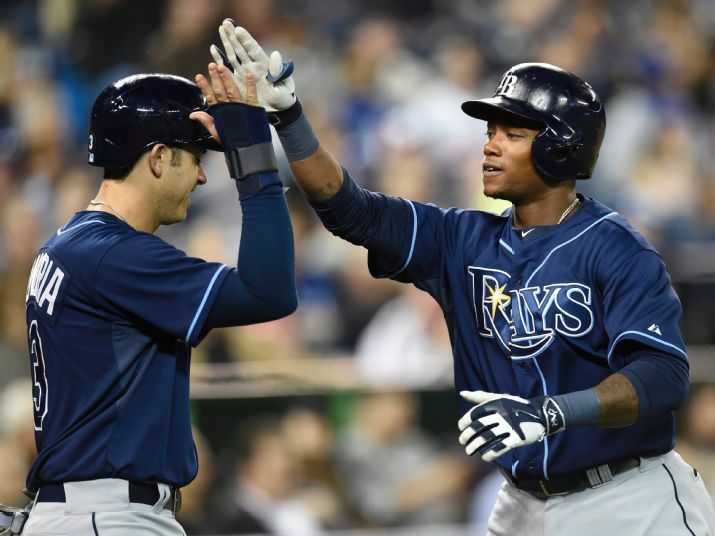 The Rays will work out prior to the game at Tropicana Field for the second straight day. 3B Evan Longoria is a late scratch from the lineup due to an illness (a cold). He instead will take part in drills at the Trop as a simple precaution against dehydration. Longo would play during the season. Kevin Cash called Nathan Karnes and Jake Odorizzi as the number two and three starters behind Chris Archer to start season for games two and three against Baltimore. Cash told Marc Topkin the decision was based on matchups, although a keen onserver could see this decision in the making — with both Archer and Karns scheduled to pitch this afternoon, the rotation was set for Archer to start Monday on four days rest and Karns on Tuesday on regular rest. The number four starter is TBD. Recent acquisition Erasmo Ramirez “most likely” will be used as a starter, however, the team will wait to talk to him upon arrival Tuesday night. Cash also said Matt Andriese is still “in a good spot,” suggesting he will be used in bullpen. 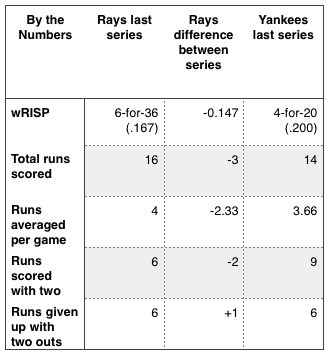 It should noted, the Rays need a fifth starter for the April 14th game against the Toronto Blue Jays. How much Ramierz can you take? Ian Malinowski (DRaysBay) writes, right now, the newest member of Tampa Bay Rays pitching staff is a just a stopgap because of injury, but he has the potential to stick in the rotation. Click the link to learn more about the Rays newest starter. Drew Smyly threw live batting practice at the Trop Tuesday and will do so again on Saturday. All signs point to a good session, “based on his reactions and the high-fives from his teammates,” writes Marc Topkin. Alex Cobb played catch again, while Alex Colome will throw live batting practice on Friday. We love our peanuts and Cracker Jack, but how about adding some flatbreads and stuffed baked potatoes? Enjoy new flavors at the Trop this season with local favorites Taco Bus, Ricky P’s and more. For me, nothing changes. It doesn’t change anything that we discussed whenever we talked about me pitching April 7. I specifically said my mindset is going to remain the same because I knew that anything could happen. …Maybe that’s why I wouldn’t treat it differently. Because it’s just a baseball game. It’s the first one of the year, but the first one’s no more or less important than the last one. His year [last season], the effort, the work he’s put in. You don’t want to take anything away from Cobb. It was his. He’d earned that. But we’re extremely comfortable with having that guy now be Arch. …He really cares. He cares about what he’s doing, and he cares about the people around him, too. We had lunch and we didn’t talk about him at all. We talked about his teammates and some different things he brought up over the course of his couple of years here. Impressions he’s seen and stuff like that. He’s got a very team-first approach. In other roster moves, Cash whittled the spring roster to 44 by reassigning pitchers Ronald Belisario, Andrew Bellatti and Bryce Stowell, and infielder Eugenio Velez. More moves are expected Friday, so the team can start placing players on the disabled list which would allow for other players to be recalled. Everett Teaford will get the start against the Orioles Friday afternoon. The LHP remains in the hunt to land a spot in the Rays starting rotation. Mike Montgomery, who is also a contender for a rotation spot, is expected to see action as well. .
Make that seven relievers and 13 strikeouts on the day. Jordan Norberto and Ernesto Frieri combined for eight of those strikeouts. Kriseman wouldn’t have to make a last-ditch effort before anything if he hadn’t set a (second) arbitrary deadline of Opening Day in the first place. I’ve previously written how the mayor’s self-imposed deadlines only serve to reduce his negotiating power with the Rays. There’s nothing to gain; deadlines could only make him – not the Rays – look bad if they’re missed. In fact, it may have led to the unpopular deal the mayor couldn’t get through city council in December (ahead of his first self-imposed deadline, Dec 31). We’ll see what happens when Mayor Kriseman introduces his new memorandum of understanding to the city council today.